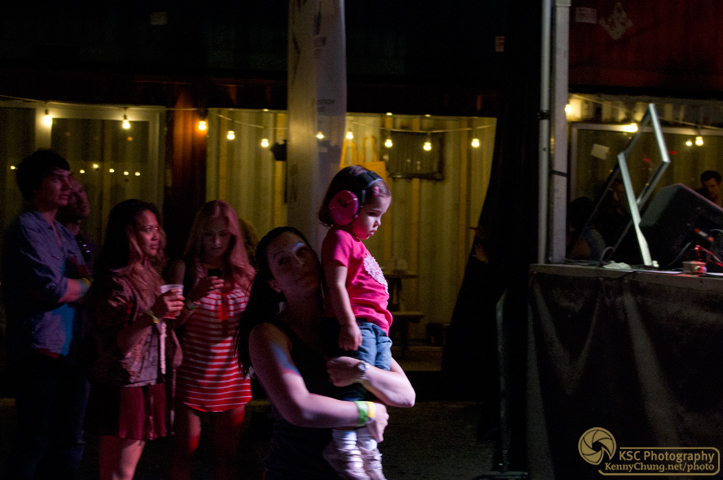 The Brooklyn Night Bazaar was a festival of food vendors, local merchants, and great music. 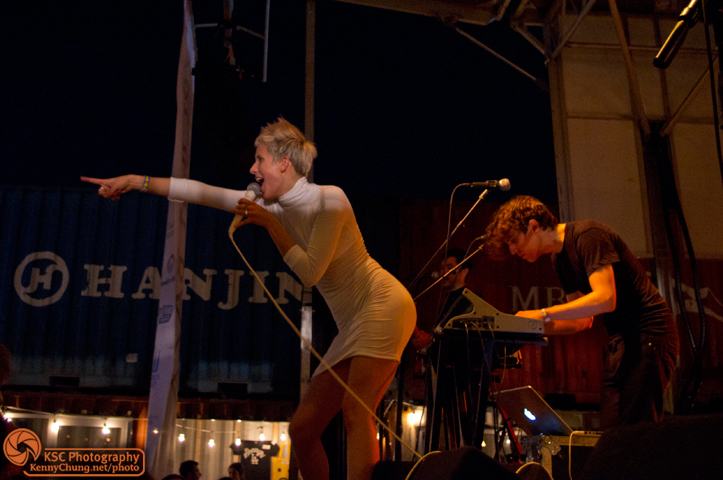 In a stage area surrounded by shipping containers, YACHT played to a reactive Brooklyn crowd, with Monogold as the opening band. Like The Head and the Heart, I had first heard YACHT on Turntable.fm. 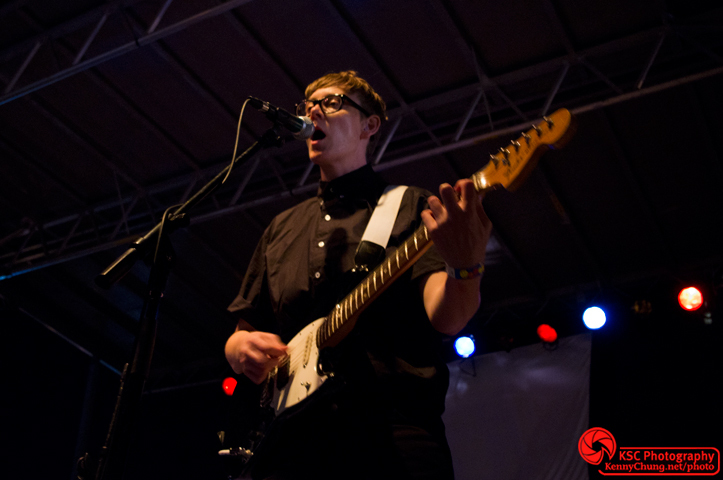 I had seen Monogold once before when they opened for God Is An Astronaut at the Bowery Ballroom. Monogold bassist Mike Falotico and guitarist/singer Keith Kelly. During their set, Keith was playing the toms and a piece of his drumstick splintered off and hit me in the chest, which was pretty funny. He asked afterwards if he had got me. 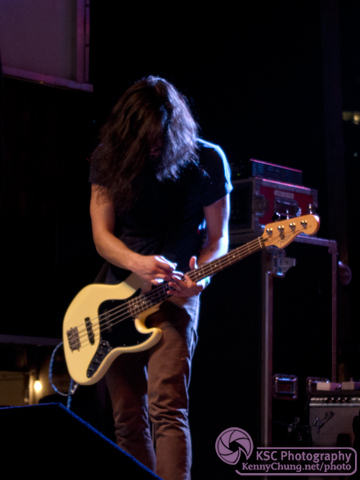 Monogold Bassist Mike Falotico at Brooklyn Bazaar. Some parents actually brought their young child to the Monogold show. Luckily, she was equipped with noise blocking headphones. YACHT Jona Bechtolt and Claire Evans at Brooklyn Bazaar. 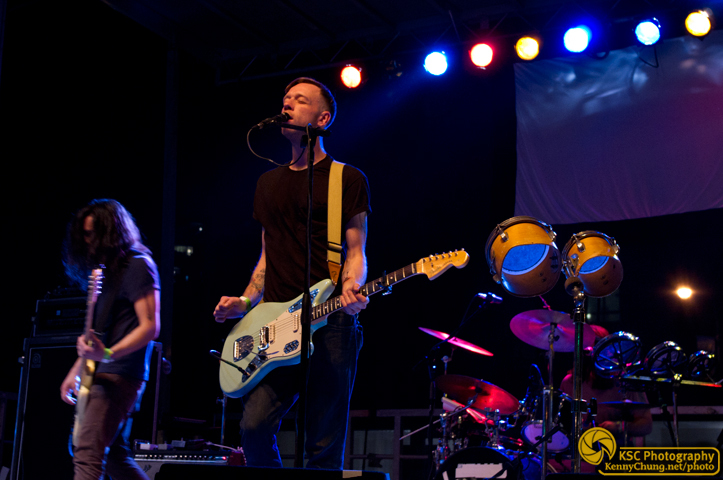 Jona Bechtolt, Bobby Birdman and Claire Evans performing on stage. 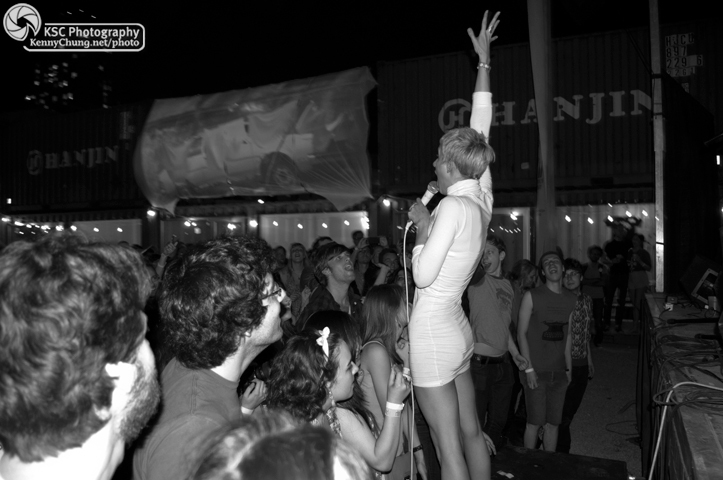 Singer Claire Evans standing tall on stage at Brooklyn Night Bazaar. 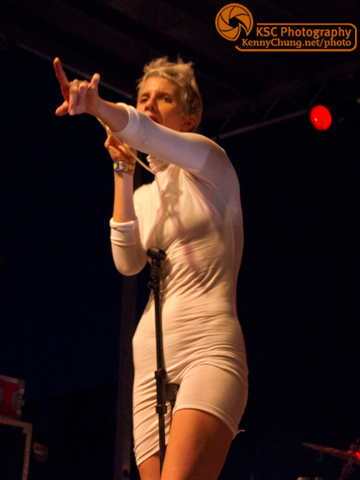 YACHT guitarist and synth player Katy Davidson on stage. Claire made it out into the crowd several times during the set and even made it halfway down the audience. The crowd loved it. Claire and Jona on stage. 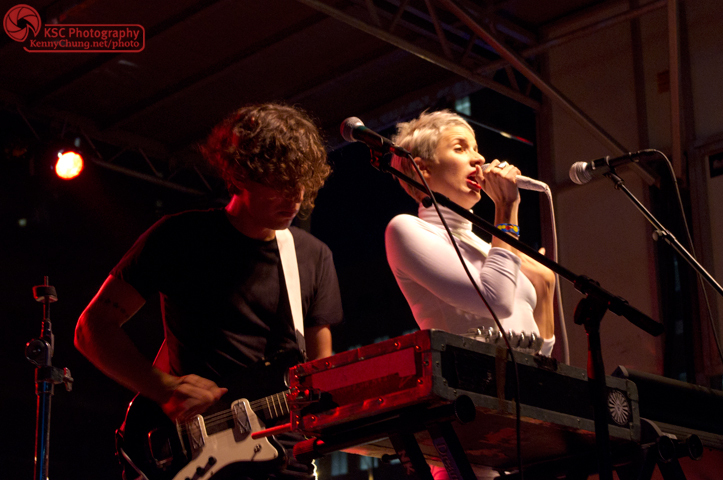 You can see the shipping containers in the background, as well as YACHT's merch container. Claire throwing up the devil horns. 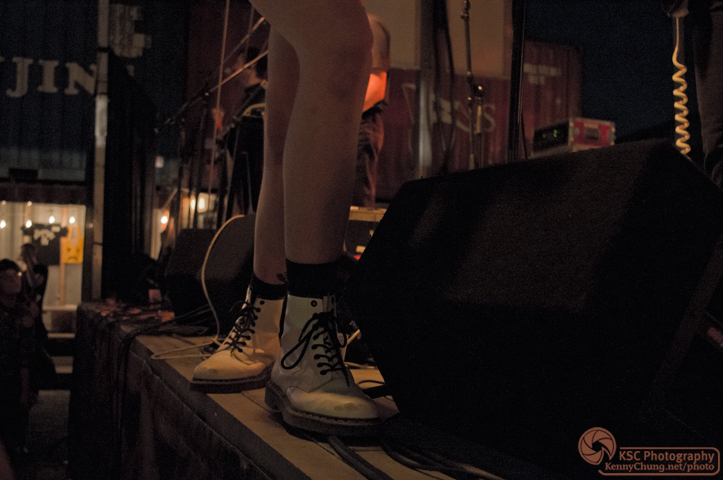 Claire Evan's white high-top sneakers that matched the rest of her outfit. YACHT finishing a fun and energetic set. Unfortunately, there was a performance curfew and the band couldn't return for an encore. No "Shangri-La" for Brooklyn!